Award-winning image editor with pretty interface and powerful features ! 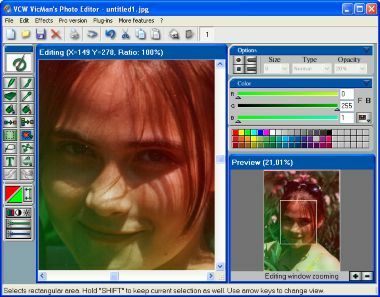 VCW VicMan's Photo Editor is a versatile image editor with intuitive interface and a variety of features. This powerful application is user-friendly, offering users the simplicity of image editing, high productivity and easy customizing abilities. Now you don't have to fork out hundreds of dollars for a quality image editor . This award-winning application is free downloadable and comes with a wide range of essential features for both novice users and professional designers . With VCW VicMan's Photo Editor you can refine your digital photos, draw artwork naturally and effortlessly, produce superb graphics for the web. user-friendly, offering users the simplicity of image editing, high productivity and easy customizing abilities.